★ LOOGAROO ★: SUPA STRIKAS | GOOOAL! Internet lines between Miramichi, Canada & Cape Town, South Africa just got a lot busier! Cape Town’s Strika Entertainment and Miramichi’s Fatkat have just inked a deal that has both studios banding together to produce the new animated series “Supa Strikas” (13 x 22 minutes), based on Strika Entertainment’s popular comic book of the same name. 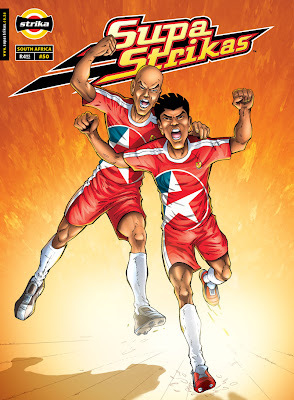 The Supa Strikas comic book has a readership of 10,000,000 people across 14 countries, distributing in excess of 1.3 million comics every month… and those numbers are growing. Supa Strikas have always been a successful and much loved club but things have just stepped up a gear. Supa Strikas have qualified to play in the world’s Super League, the ultimate prize for any soccer club and boyhood dream of any player. 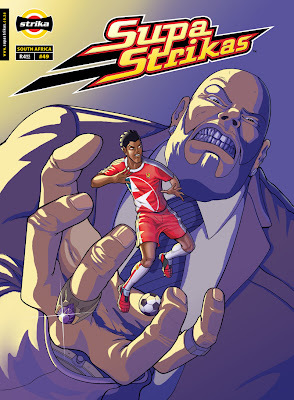 Supa Strikas revolves around a talented young striker, Shakes, and his steady rise to the legendary No.10 position for the very team and number his late father held. 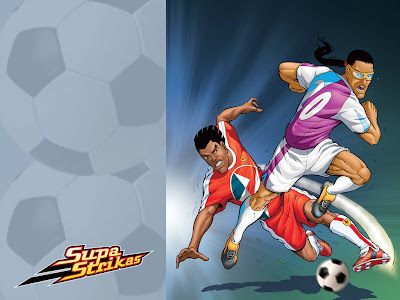 – Supa Strikas! Shakes must answer the questions left by his father’s legacy and ensure that he continues to deliver the one thing that matters most… Goals! “We’re excited about banding together with our pals at Strika Entertainment, the comics are great and the translation of them to TV is going to be a lot of fun, you should see the first episode!” - Gene Fowler, CEO of Fatkat. The production partnership has Strika Entertainment executing with Big Hug Productions on the scripts, while they handle the initial design, storyboards and post production processes. Dacapo Productions has been tapped for Sound Design and Fatkat follows up with design of characters, props, backgrounds, assembly and animation in both Flash and Maya. “It’s very rewarding to finally see the Supa Strikas characters come alive on the small screen! 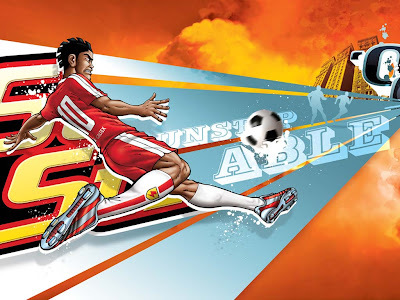 We look forward to a very successful alliance with Fatkat!” -Oliver Power, Executive Producer of Supa Strikas. The first full 22 minute episode will be available for screenings at Mip Junior and Mipcom in October 2007. PS: With Big Show producing and Pat Proulx directing, this show is going to look amazing! !